Laurea has been part of the Finnish Border Guard’s and the Ministry of Foreign Affair’s SARC (Arctic Maritime Safety Cooperation) project since 2017. The project aims to develop cross-border collaboration with the maritime safety authorities representing Arctic industry and research. The project runs throughout the Finnish chairmanship of the Arctic Coast Guard Forum (ACGF) during 2017–2019. As a side-project, Laurea’s project team consisting of Pasi Hario and Elisa Norvanto was tasked to study on how to enhance collaboration between the ACGF member nations consisting of Canada, Finland, Denmark, Iceland, Norway, Russia, Sweden and the United States. As a result, Laurea’s project team compiled a report on “Developing Arctic Maritime Safety Cooperation through Enhanced Training Cooperation”. The article first explains the background of the assignment, then the conducted results and finally sums up lessons learned from project managements perspective. The roots of the assignment lie on the ACGF’s will to deepen the cooperation in the Arctic. The primary objective of the current report was to list the reported training offerings of each nation connected to Arctic Search and Rescue at Rescue Coordination Center (RCC), On-Scene Coordinator (OSC) ja Aircraft Coordinator (ACO) levels. An additional objective was to map out the venues for future training cooperation among the member nations. The data was collected during the Arctic Coast Guard Forum Workshop that was held on the 1st and 2nd of February 2018 in Helsinki Finland and via online surveys. 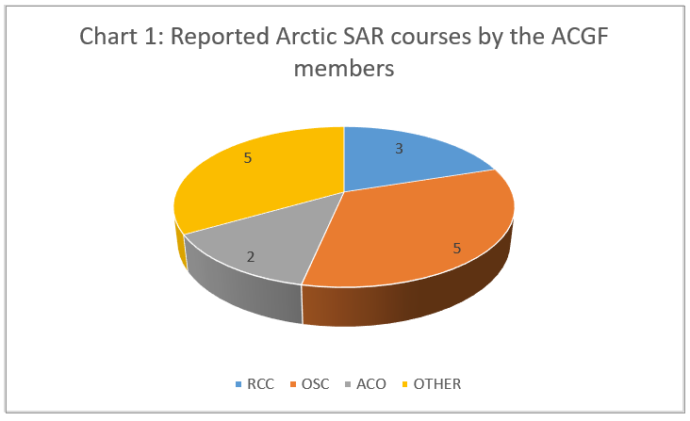 The first survey asked respondents about the current Arctic SAR courses organized by the official authorities of the member states. The second assessed the will and needs for future training cooperation among the nations. The ACGF nations were well represented at the workshop and answered to the surveys promptly. Twenty participants from seven out of the eight ACGF countries attended the workshop in Helsinki. Likewise, seven out of the eight ACGF member countries answered the surveys. In brief, there was a strong will to cooperate and open the Arctic SAR courses for other nations. Also, the member states show great interest in organizing the courses jointly with the others (see charts 1-3 below). The shared desire of the member states, raised both during the workshop and in the survey, was to enhance the overall cooperation of personnel involved with Arctic SAR regardless of the operational level. Even though this report concentrates mainly on the RCC, OSC, and ACO levels, the Search and Rescue Unit (boats and aerial crafts) or crew level cannot be overlooked. Although communication and operational coordination takes place at the upper levels, it is the individual members of the crew who must know what his/her counterpart is doing in the other rescue Units. 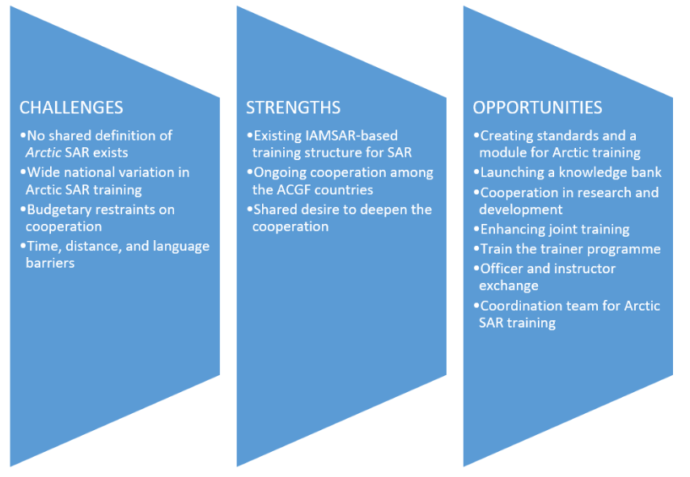 Picture 1: Challenges, strengths, and opportunities for future training cooperation. Even though, the ACGF concentrates on developing Arctic SAR, there is no shared understanding of what the Arctic constitutes. However, “Arctic” as a geographic area with specific conditions establish certain requirements for SAR. polar bears are a factor in the Arctic Sea. Still, both the challenges to and definition of Arctic SAR will take root as ACGF cooperation advances. There are no shared standards or format for Arctic SAR. Even though SAR is based on IAMSAR I-III (Manual International Aeronautical and Maritime Search and Rescue Manual), every country has its own national means of training for Arctic conditions connected to geographical, institutional, or cultural circumstances. In some countries, Arctic training is an integrated and a natural part of the national SAR (e.g. Norway, Russia, and Finland). In others, the approach to Arctic training is to conduct it in specific geographical maritime areas (e.g. Canada, USA, and Denmark). Still other countries integrate Arctic knowledge as on-the-job training for ships operating in the Arctic area (e.g. Canada, USA, and Denmark). Could there still be shared and recognized standards for Arctic training that could be delivered through different training methods? Every nation has its own limited budget for international cooperation. For example, participants agreed that it would be beneficial to build an Arctic training center of excellence that would offer training to all ACGF nations and organize shared multinational Arctic SAR courses. However, finding the right nation to handle the budgetary responsibilities would be impossible. It is also difficult to find money for sending personnel to other countries for courses if there is an existing national training course in place. This is especially true when travelling across the Atlantic. Cooperation is also constrained in terms of time, distance, and bureaucracy. Besides money, participating in courses or developing Arctic SAR in workshops and seminars abroad requires time and takes away from the time spent at the daily job. Some of the courses are held partly or completely in the various national languages. It would be impossible to participate in those courses without the proper language proficiency. Although Arctic training is unevenly incorporated within SAR (see the discussion on the wide national variation in Arctic SAR training), the contents of basic SAR training are somewhat similar in every ACGF country since the training structures are based on IAMSAR I-III. This is especially true with respect to ACO-, SCO-, and RCC-level training. There is tested and institutional cooperation in Arctic SAR among the nations. There is a wide variety of bilateral cooperation, especially between nations that share a border, in terms of Arctic Search and Rescue Agreement Areas of Application. There is also multilateral cooperation in, for example, the ACGF forum and Arctic Security Forces Roundtable. The cooperation has taken different forms, such as officer exchanges, attending national SAR courses, and organizing joint exercises. Excellent lessons can be learned or taken advantage of based on existing cooperation. There is a strong desire to deepen the training cooperation (and cooperation in general) among the ACGF nations. The desire derives from understanding the future risks presented by increasingly levels of Arctic traffic, the institutional development of ACGF, the benefits in shared knowledge and best practices, and possible budgetary savings. The positive results of opening Arctic SAR courses to other nationalities and jointly organizing those courses reflect this desire. By collating the best practices and lessons learned from each member country, new standards for Arctic training could be created. The next step would be to build an ideal Arctic module, perhaps as an add-on to national courses. There could be different Arctic modules for different levels of training. ACGF countries could also add their national characteristics to the learning objectives of the co-created Arctic module in order to meet the training criteria for a specific area or in relation to different national doctrines. In the future, the Arctic module could also be offered to commercial operators. By creating an electronic platform and database, the ACGF could share best practices, lessons learned, training material, and standard operation procedures. The platform could also host easy access e-learning material and videos. At best, the platform would support the training both at on-land training facilities and on-board ships while at sea. One solution would be to collate and create the material as a jointly funded project so as not to overburden already stretched national Coast Guard training organizations. Alongside the collected best practices, much national research and development is being done in terms of the equipment used in Arctic SAR (e.g. on-board Arctic rescue kits). The knowhow for what equipment to use and when could be put into better circulation. In addition, the ACGF nations could launch joint research and development projects in, for example, the fields of using automatic vessels, unmanned aerial vehicles, and drones in Arctic SAR. Automatic vessels could be extremely useful in search and rescue operations in the vast Arctic environment. Some nations have specialized training, such as ice-piloting, ice-navigation, cold weather engineering, and topside icing, which is done in true Arctic surroundings. Access to these specific courses could benefit nations that do not have the possibility to organize such courses regularly or at all. However, the desire to send personnel to attend foreign courses may constitute a problem if a similar national course already exists and due to limited budgets for sending participants to attend foreign courses (see section on budgetary restraints on cooperation). A practical train-the-trainer program could be an effective way to exchange best practices among the ACGF nations. The knowledge and skills the trainer acquires during the program could be transferred back to the sending nation’s training institutes and then integrated within national courses. Gathering trainers together as a group instead of sending individual participants to courses could also be more a cost-effective means of dealing with the limited budgets of the various member states. A similar, but more abbreviated version of the train-the-trainer program would involve sending instructors instead of normal course participants to other nations’ SAR courses. The instructors could both support the attended course with their experience and then bring home the knowhow. Personnel exchanges could be applied at every level of Arctic SAR, but especially at the ACO, OSC, and RCC levels, as these operators are supposed to handle the practical cooperation in, for example, multinational mass rescue operations. The exchanges would help spread knowledge about the standard operation procedures, command and communication systems, and other nations’ SAR environments and promote the sharing of best practices. A coordination team of training experts could be established with the task of creating shared Arctic SAR training and fostering cooperation. They could work from their home offices and do the coordination work mainly online. The team could facilitate dialogue about fostering exchanges and collect and disseminate information on open training courses for professionals in other ACGF nations. The assignment was a good example of a follow-up project brought to Laurea’s table by a successful track record in the same sphere of research. It shows how foothold and credibility are vital and beneficial in particular research communities and state official networks (in this case the security authorities). The project was planned and implemented in good cooperation with a close partner from earlier projects (The Finnish Border Guard). However, there could have been training and a checklist on how to conduct with the client in these kind of semi-business, semi-RDI-projects. It would help to be able to describe a couple of default research products the client gets with certain working hours. It is vital to make clear what kind of end-product the client gets with certain resources. Otherwise, Laurea ends up paying the exceeded working hours. In the beginning, the client was not certain, what were the specific results they wanted from the project. Even more, the contents and purpose of the initial workshop in Helsinki changed during the day. These factors meant that it was vital to have a continuous dialogue with the representatives of the client and to document their approval to changes in the original agreement. As the project consisted of gathering data from only one workshop and conducting two online surveys, it was an agile and independent way to do research and was easy to settle among the responsibilities of other projects at hand. However, it took several notifications before the representatives of certain ACGF member countries (although being semi-military) responded to the online surveys. It needed quite a lot of nudging through official ACGF channels to get enough answers. To prepare for the worst, it is important to clearly state in the agreement that the end-product is just as presentable as the answers filed in. Hario, Pasi and Norvanto, Elisa (2018), Report on ’Developing Arctic Maritime Safety Cooperation Through Enhanced Training Collaboration‘, Finnish Border Guard.